Today we commemorate the great saint of Auschwitz, Saint Maximilian Kolbe. 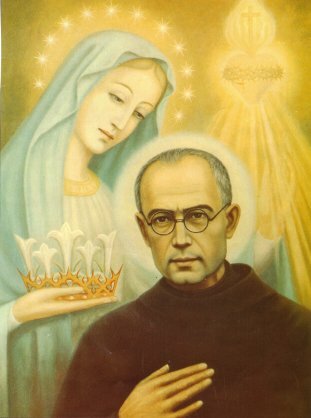 St. Maximilian was born, Raymond, to Julius Kolbe and Mary Dabrowska on January 17, 1894. At the age of ten years old, he had a vision of the Blessed Mother. She presented him with two crowns and asked him to choose between them. The first crown was white representing purity and the second was red representing martyrdom. Young Maximilian chose both! Like many saints before him, he knew as a child that he had a vocation to religious life. At the age of 13 years old, he joined The Conventual Franciscans and made his first set of vows in 1911. After years of study in his home country of Poland, Maximilian was sent to study in Rome. He was ordained a priest on April 28, 1918. Many people know how this great saint gave up his life in the concentration camp of Auschwitz, standing in for a man who had a family. After days of surviving with other prisoners in a starvation hut, his German captives injected Father Maximilian Kolbe with carbolic acid. He died and entered heavenly glory on August 14, 1941. The man, who St. Maximilian Kolbe stood in for, Seargeant Francis Gajowniczek, survived World War II. He spent the rest of his life speaking on the Saint of Auschwitz around the world. What many people don’t know about this great modern saint is that he had an intense devotion to the Blessed Virgin Mary. He had such a love for the Blessed Mother that he founded the group – “Militia of Mary Immaculate.” This group began with humble beginnings at the time of his ordination in 1918. It has grown to be a worldwide organization within the boundaries of the Catholic Church. It has received the blessings of many popes over the years. 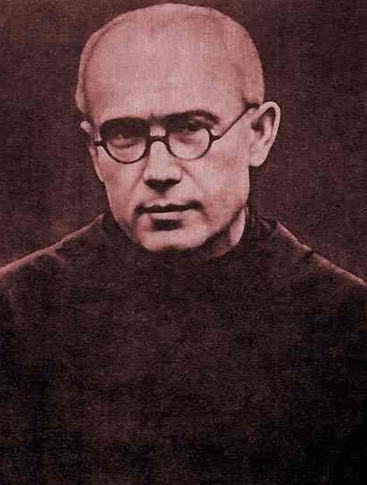 Saint Maximilian Kolbe founded the Militia Immaculate in response to the growing threat of Free Masonry (Freemasons). While still a student in Rome; he was walking home to the college and witnessed in St. Peter’s Square an unauthorized demonstration of Free Masonry. They were denouncing the Church, the Pope, and had a picture of Satan crushing the head of St. Michael the Archangel. The Freemasons were and still are a great danger to the Catholic Church. Where Communism and Socialism would stand face-to-face with the Church, the Freemasons would sneak around the back of the Church and pick pocket her from behind. For more information on Saint Maximilian Kolbe here in the United States, please visit the website of Marytown – The National Shrine of Saint Maximilian Kolbe. For more information on the Militia Immaculata and Consecration, please visit their website.